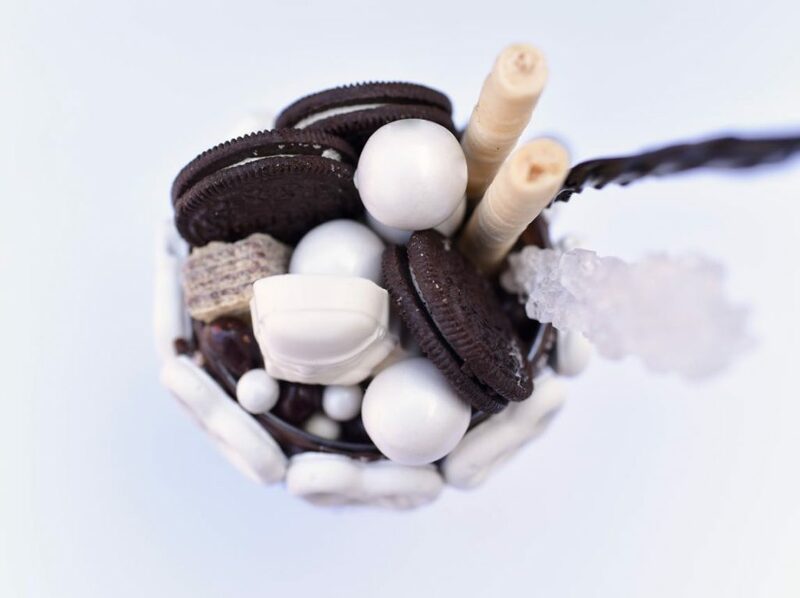 Who else is obsessed with giant over the top, candy coated freakshakes? 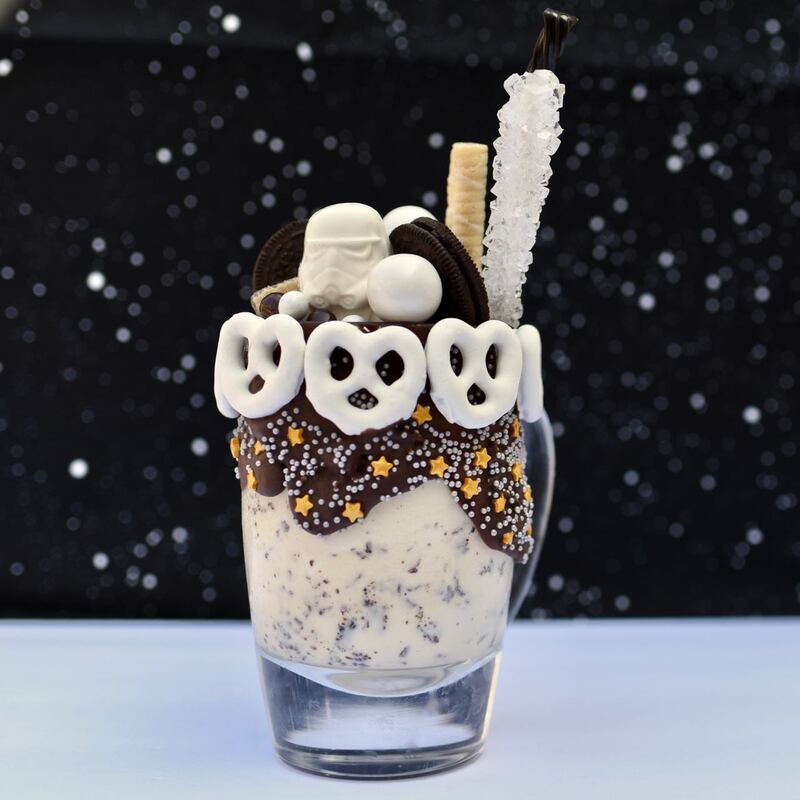 With the opening of Star Wars: Galaxy’s Edge later this month at Disneyland, I wanted to create a Star Wars freakshake to celebrate. 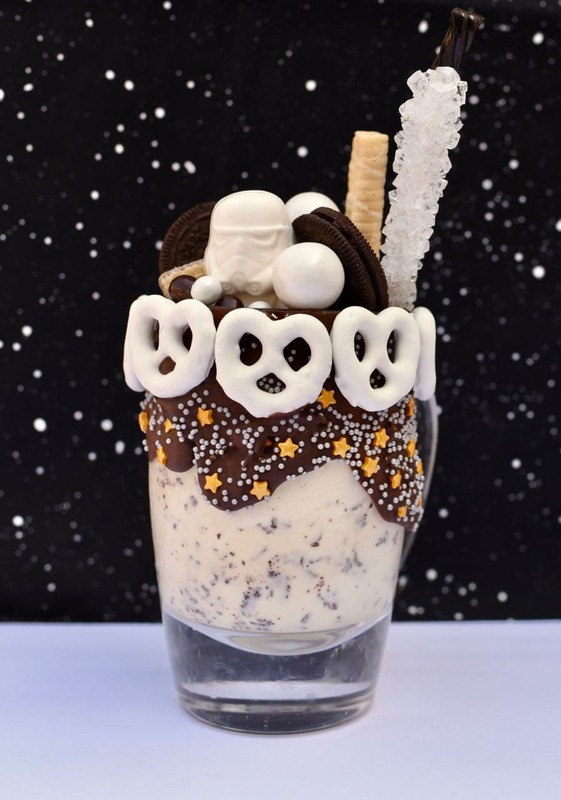 We’ll be going to Disneyland later this year to soak in all the new Star Wars goodness, so this Star Wars freak shake will have to satisfy our craving until then. In the past I’ve shared with you my Dumbo freakshake and my Finding Nemo freakshake, so you probably already know what a freakshake is. Basically, anything goes when creating a freakshake- the more over the top and the bigger your concoction is, the better! Even though they were the “bad guys,” I always liked watching the storm troopers. My Star Wars freakshake has a storm trooper theme, which means that I stuck with a black and white theme for my freakshake, with a few gold stars and silver sprinkles added for fun. Step 1. Find a nice big clear glass for your freakshake. 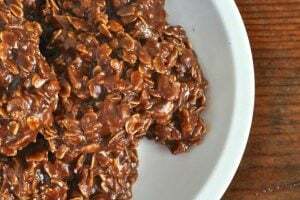 Melt the chocolate almond bark according to the directions on the package, then drizzle the melted chocolate down the side of the entire glass. While the chocolate is still warm, press white chocolate covered pretzels across the top of the glass. Do one at a time, then wait a few seconds until it “sticks” before moving onto the next pretzel. Sprinkle gold stars and silver sprinkles over the melted chocolate. 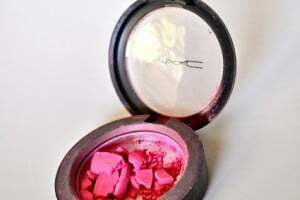 Place in the refrigerator or freezer until the chocolate is completely hard and everything has set. Step 2. Use a Star Wars candy or Jell-O mold to create a white chocolate storm trooper candy. Melt the white chocolate, fill up a storm trooper mold, then let sit in the fridge for a few minutes until the chocolate has set. 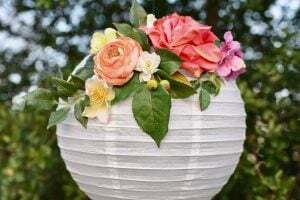 Once set, pop it out from the mold and set aside. Step 3. Mix up your milkshake how you like it with your ice cream and milk. I like my shake really thick, so I barely use any milk at all, but make yours the way you like it! Step 4. Now for the fun part- creating your over the top sugar-coated masterpiece! Really, anything goes here, but here’s what I did. I started by placing the taller pieces in the back right, which include the rock candy stick, the black licorice, and the rolled candy cookies. Next up came the Oreos, the smaller square wafer cookies, the storm trooper chocolate, the white gumballs, then the white Sixlets and chocolate covered peanuts. I’m so happy with how my tasty Star Wars freakshake turned out, and so are my kiddos! I let them help me devour it, and it pretty much made their day. 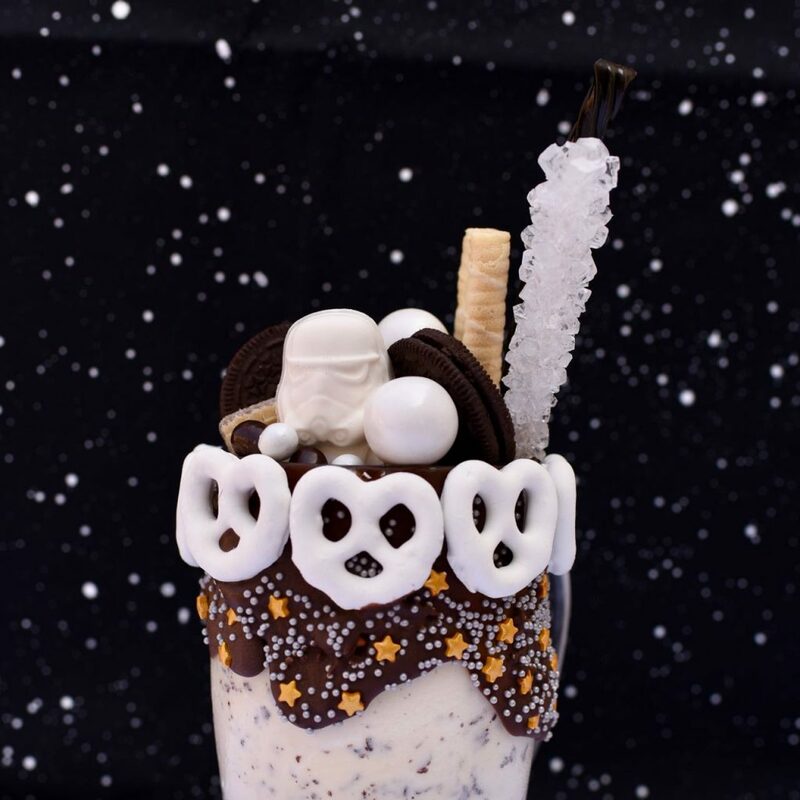 Try making a Star Wars freakshake today, and let me know how it goes! If you’re a Star Wars fan, you’ll love our Star Wars The Force Awakens birthday party, Star Wars Rebels Party, and our Star Wars Rebels movie night. Here’s some other really cool Star Wars freakshakes that my creative friends came up with. Aren’t they fun?! ?